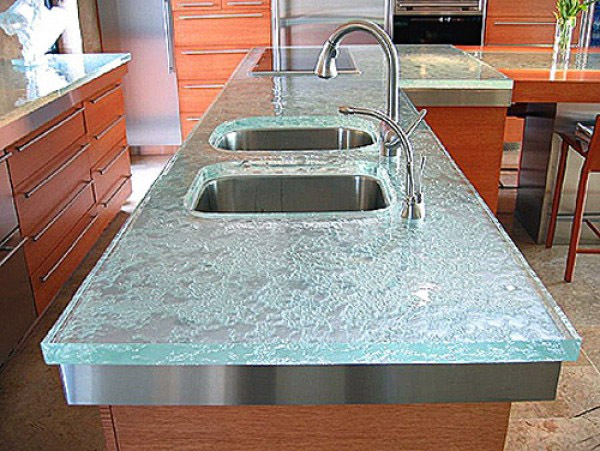 Custom architectural crafted glass, tempered glass, textured glass pieces, and the ancient art of verre églomisé, or reverse gilded glass, are applied to contemporary uses including countertops, backsplashes, and tabletops. Glass work may be customized to suit, then installed on site . The glass is non-porous, relatively stain-proof, extremely hygienic, and "extremely heat resistant (up to 700 degrees)." Much work is being done to "recycle" glass using sources such as post consumer glass or post industrial float glass. The material can be crushed or cut into strips that is heated until the softening point of glass, binding the loose material back into a solid form.